Language and words are powerful tools for generating conversations and gaining success in business. Your choice of marketing words can make or break someone’s decision to buy from you. It becomes all the more essential to choose marketing words and phrases that convey your specific message and influence people to buy from you. Vertical Response has put together 20 marketing words and phrases that will greatly help you in adhering to your client’s wants and receiving the revenue you need to achieve your business goals. Does your marketing language play up your positives? Please share your insights and let us know which of these marketing words is working best for your company. Words have power; we all know that. But do you know which marketing words encourage subscribers to act, customers to buy, or donors to give? We read through dozens upon dozens of emails and compiled a list of “sales-boosting” marketing words and a list of “sales-deflating” terms. Keep these lists handy the next time you craft an email or social post. 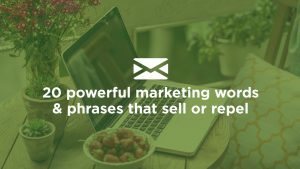 1.Sale – It’s the Old Faithful of marketing words. While a lot of businesses use the word “sale,” it has the power to motivate customers. Who doesn’t love a good deal? 2. Off – If you can offer your audience an incentive like “50% off,” or “$25 off your next $75 purchase,” you’ll pique interest quickly and give customers added incentive to buy. 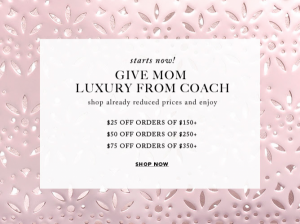 Take a look at the Coach offer below. 4. New – Customers are intrigued by the newest gadget, product, or offer. It’s an attention-grabbing word that’s effective in emails.